Belts adorn your waistline as well as your outfit. A cheap belt spoils your entire style statement. A belt is a very important accessory not only for your outfit but also for your wardrobe. So, instead of spending money on cheap belts every 3 to 6 months you should invest in high quality leather belt which scores high on style quotient too. Our range of ostrich belts is what you are looking for. 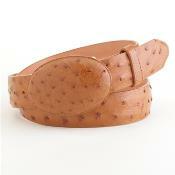 So, look no further and check out vast types of ostrich belts we have. 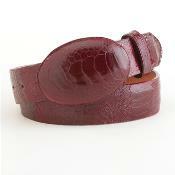 These belts are made from the best quality treated alligator belts leather. It is crafted with care and passion to liven up your outfit. Ostrich leather is the most premium quality of leather known for it's softness and texture. These exotic belts are hand crafted with passion by our highly talented and well experienced craftsmen. They hand pick each part of the belt to eliminate all defects. The buckle is strong made of high quality metal. The luxurious ostrich belts are adorned with solid brass buckles, stainless steel and nickel finish. You can chose from various colours like silver, golden and copper colours of the buckle. Single or double keepers, heavy duty screws or snaps keep the belt in place when you wear one. Options of removable and static buckles are available. Keeping in mind your preference of style we have made these ostrich belts in various patterns and textures along with a myriad of colours. If you have a bold personality with a bold style you can go for colours like Cognac, Dark Brown, Chocolate, Olive, Tan, and Orange and if you want to keep it simple then you can choose from the basic colours like Black, Grey, Natural hide colour and many more. The belts come in tapering style as well as with straight square or round edges. Different kinds finish like glossy, matt, textured and so on are available. The number of holes and the gap between them range from 5 to 7 and ¾" to 1" apart, respectively.You might be thinking that these belts would be so heavy and thick that they would look out of proportion on your waist. Well, to solve your problem these best Ostrich belts are light weight and sleep which give an ultra modern look to your personal style. Personal style need not shout out loud which is so true for these extremely stylish belts that the stitch is also available in options of self coloured to contrasting colours. 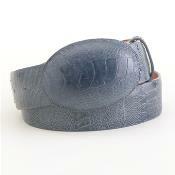 Ostrich belts never compromise on quality so they are stitched with extremely strong nylon threads. The belts are made to undergo daily wear and tear and are easy to maintain as they are water resistant and scratch proof. To answer all your prayers we have one for every pocket. The price range will suit every palette. The ostrich belts are an investment in the long run as they come with 3 years warranty but they are built to last at least 30 years. Available in a very short time these belts are a must for your sophisticated wardrobe. 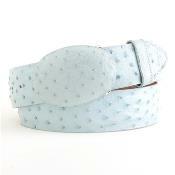 Book your custom Ostrich belt today to grab some fabulous deals, today.